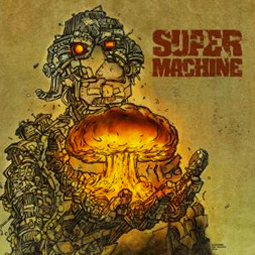 “SUPERMACHINE is exactly as the name describes. This is a band of extremely talented guys playing a style of hard rock and groove metal that will have you moving in your chair. The songs are catchy as hell while still maintaining the huge groove they are built around. Recorded and Produced by Benny Grotto and SUPERMACHINE at Mad Oak – Allston, MA. Mixed by Benny Grotto at Mad Oak Studios – Allston, MA. Mastered by Chris Goosman at Baseline Audio Labs – Ann Arbor, MI.